Our neighbors, Chris and Shelly, are about the nicest neighbors anyone could ask for, always ready to lend a hand. Or a vegetable — Shelly sent over two giant zucchini and an equally large summer squash on Sunday, grown in their backyard garden. The squash & ‘zuke were perfect for the Vegetable Tian recipe I’d been eyeing. It was very simple to pull together, makes a very pretty presentation, and very tasty. 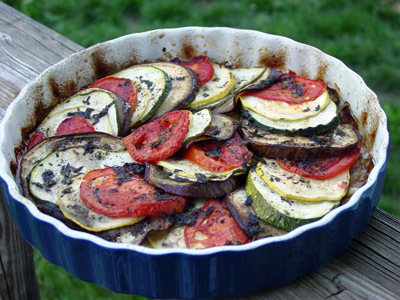 Preheat oven to 350-degrees F. Lightly grease a 9-inch gratin or round baking dish. Heat 2 Tbsp. oil over medium heat. Add leek and garlic, season with salt and pepper and cook until soft, about 5 minutes. Spread into baking dish. Arrange vegetables on leek and garlic in slightly overlapping circles, alternating zucchini, squash, tomatoes, and eggplant. Top with wine, 1 Tbsp. Extra virgin olive oil, oregano, salt and pepper. Bake 30 minutes. Drizzle with remaining 1 Tbsp. Extra virgin olive and bake until vegetables are tender, 30 minutes more. Serve with Parmesan. ← Saturday Morning Food Expedition in Rochester, NY.